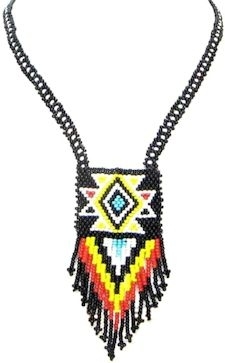 The handle is wrapped in gold buckskin, and is decoraded with glass seed beadwork in a red, yellow, and multicolor bead pattern. The beadwork is surrounded by tan rabbit fur. The buckskin streamers are decorated with glass crow beads, grizzly coque feathers, and goose wing feathers.